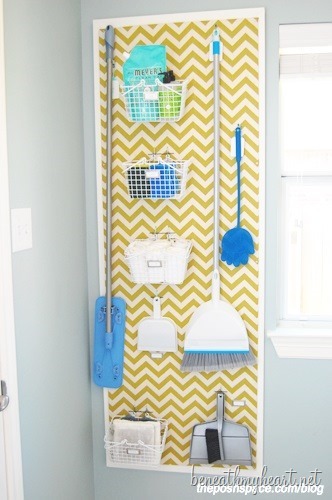 Here is a beautiful way to organize your supplies in your laundry room. Angela, from The Posh Space blog, came up with this beautiful idea. 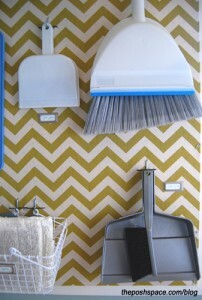 She first wanted to paint the chevron pattern on her pegboard, but the paint wouldn’t stick, so she used fabric instead. I think that makes it even prettier. To check out how she built her pegboard organizer, click HERE. This is exactly what I’m hoping to do in my mudroom, but with burlap. Now I have a tutorial! If only it would warm up as it’s an unheated space.